If you are shopping for a new heating and air conditioning system, then knowing some HVAC system basics will help you discuss your needs with an HVAC contractor and find the right system for your home. With this list of terminology you’ll be an informed consumer. HVAC System: Heating, Ventilation, Air Conditioning. This is the technical name for your heating and air conditioning system that describes what it does. Split System: An HVAC system with one component outside, such as a heat pump or a central air conditioner, and one component inside, such as a gas furnace or air handler. Package System: All components are housed in a large cabinet outside the house. Heat pump/air handler and air conditioner/gas furnace combinations are most common. 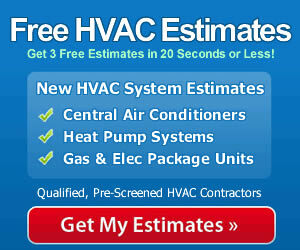 HVAC Contractor: A local heating and air conditioning company that sells, installs and services HVAC equipment. NATE: The National Association for Technician Excellence is a trade organization that offers standardized testing to HVAC technicians in order to demonstrate their expertise in the field. The HVAC contractor you select should be NATE-certified. Written Estimate: A detailed estimate provided by an HVAC contractor. It outlines the exact HVAC equipment to be provided, including brand, model numbers and serial numbers for all components. It should also list of additional materials to be used, such as a furnace plenum, gas or oil line, a refrigerant lineset, and venting materials. The written estimate should have itemized pricing for all equipment and materials as well as the cost of labor to install the HVAC system. Once you sign the written estimate to accept it, the document becomes a legal contract. Treated Air: Air that has been heated or cooled. With air conditioning, it may be called conditioned air. Furnace: A heating component that uses natural gas, propane, oil or electricity to produce heat. Central Air Conditioner: A component that cools the home, consisting of a condensing unit outside and an indoor coil usually installed above or within the furnace. AC for short. Heat Pump: An HVAC component that provides both central air conditioning and heating which is accomplished by reversing the flow and operation of the refrigerant. Air Handler: Used with a heat pump, it contains the indoor coil as well as a blower fan that circulates air through the home. Refrigerant: A specially formulated liquid that absorbs heat very readily and sheds it just as quickly. Air conditioners and heat pumps use refrigerant. It is used to move heat out of the house during air conditioning and to move heat into the house during heating. Lineset: Two copper lines that carry refrigerant between the outdoor and indoor coils of a heat pump or central AC. Coil: A component used in air conditioners and heat pumps. The coil is where refrigerant either picks up heat or sheds heat. Most coils have fins on them like a radiator in order to facilitate heat transfer. Duct Work or Ductwork: The system of ducts that carry treated air from the HVAC system to each room and the ducts that carry untreated air to the HVAC system. Ducts carrying treated air are supply ducts; those carrying untreated air are return ducts. Ventilator: This component is installed in the ductwork to draw fresh air into the home while venting an equal amount of stale air from the home. Heat Recovery Ventilators (HRV) are used in cooler climates to pre-heat the incoming air with the outgoing air during a heating cycle, without mixing the air. Energy Recovery Ventilators (ERV) pre-cool incoming air and are used in warmer climates.